We have a critter. We’ve had a critter for a long while now. I am betting he or she moved in a little over two years ago, the spring after our mountains burned. 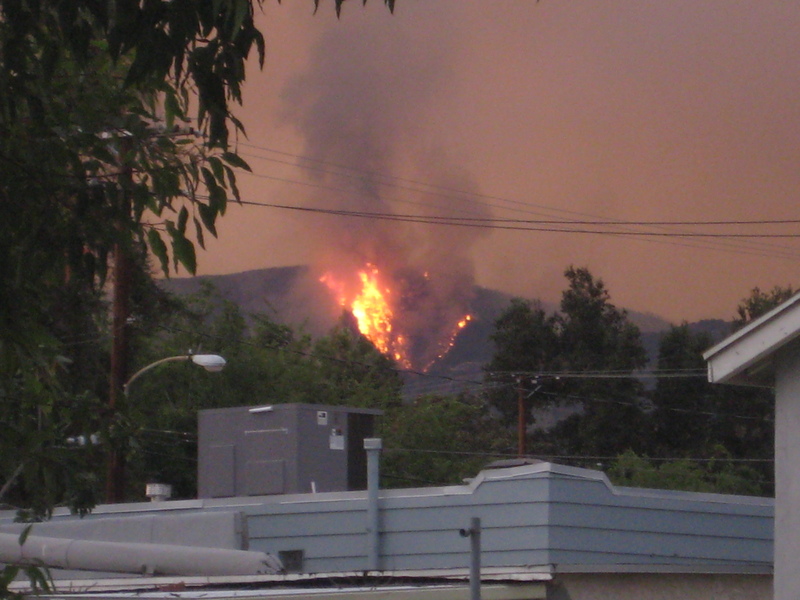 We are just at the tail end of fire season in Southern California, the time of year when the hillsides and mountain sides are dried to a crisp after the long, hot summer. The Santa Anas, a warm dry wind, swoop in to create ideal fire conditions. This year we seem to have gotten by without any large, devastating fires. From in front of our house. That was not the case in late August/early September of 2009. That was the year the Station Fire could not be contained. In those days during and after the fire our streets hung so heavy with smoke we could not see the houses across the street, friends who were forced to evacuated stored groceries in our fridge, the start of the school year had to be delayed due to terrible air quality. Two fire fighters were killed while working to put out the blaze and an uncountable number of animals either parished or lost their habitat. It is not unheard of to have visiting raccoons in these neighborhoods, even in the best of time. But, ours showed up a few months after the fire and in broad daylight. I was in the backyard with my daughter, a toddler then, as I watched the raccoon walk along the top of our fence and into the oak tree. Thinking the raccoon was sick (maybe rabid in my freaking out mom mind) I quickly ushered my daughter back into the house and looked up “raccoons out during the day.” I learned that a very hungry raccoon will break with their nocturnal habits to search for food. I cannot be positive, but I think that same raccoon found a cozy place nearby to call home and makes regular trips into our backyard to dig up grubs. Since that sighting, I have woken up many a morning to find large holes in the beds and many plants uprooted. 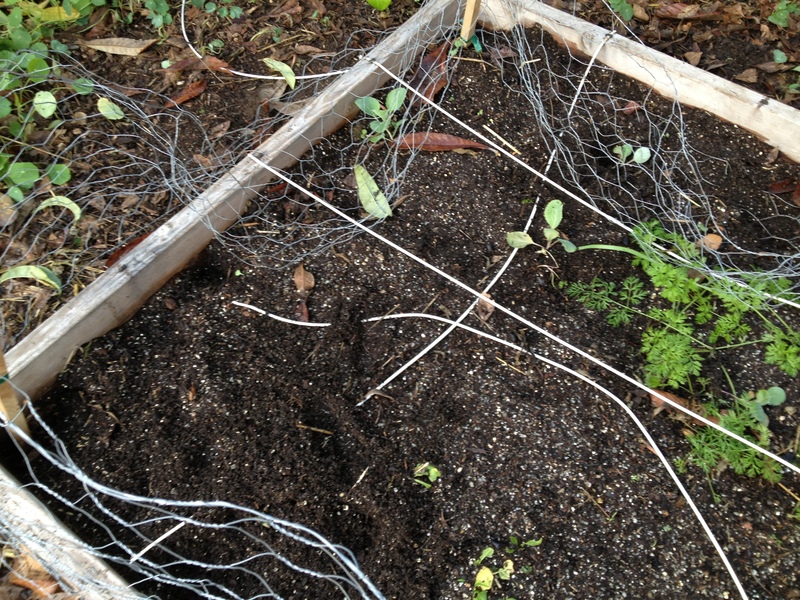 In one of these incidences the critter took out an entire row of very young, not big enough to eat carrots. They can tear a garden apart in search of those morsels buried beneath the soil. 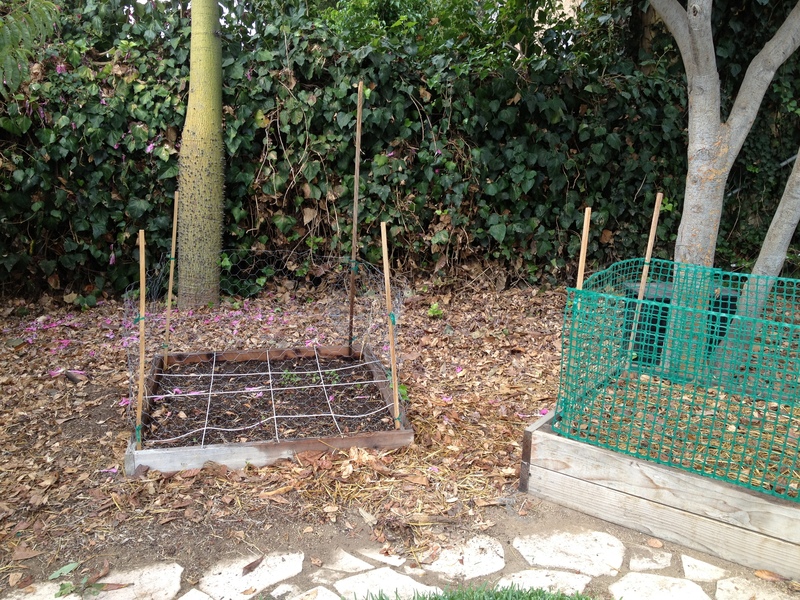 So, I started putting up fences around the garden beds like the ones below. They worked for a while…. But, it seems that now the raccoon has discovered that chicken wire bends and the stakes I use to secure it are just sitting in loose soil. This is what I woke up to the other morning. 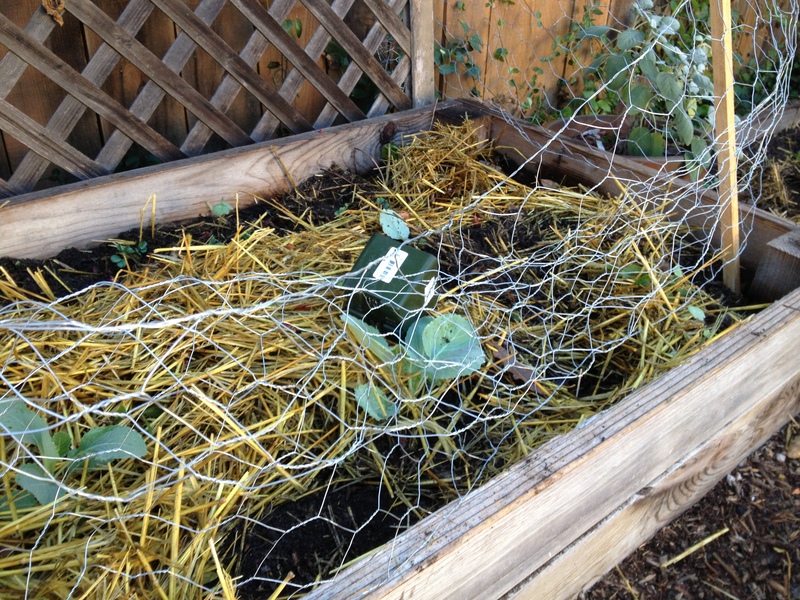 This raccoon climbed over the chicken wire and did some nice digging in this bed. I managed to replant some of the uprooted cabbages, broccoli, and kale, but lost a few too. I have had no time to bring in any reinforcements, and so hold my breath as I peek out the back door window every morning to see if there is new damage. The critter has not managed to scale the green plastic fencing, so I might be back to the hardware store for more. Any other suggestions other than coaxing the destructive creature back to the mountains to forage among the regenerating vegetation? Yes. I am perfectly happy to share my backyard. I just want to keep it from destroying all my hard work and the promise of yummy food. I totally hear you. Surely, there must be something they hate that will keep them away from the garden. Have you tried a dash of hot sauce on the plants? You sound a lot like me. I’m disappointed in the damage the [insert rats, squirrels, raccoons] cause, but I love all animals and understand their need to survive, especially as we encroach on their world. Two thoughts: One, use sturdy garden mesh. I think we bought ours at a hardware store. I’ll find the link. Two, check with your local humane society to see if they’ve implemented a resettling program. I’m sure many other gardeners are encountering the same issues. I will look into the garden mesh. I think I just need to put in some time in creating stronger barriers…. Our local animal control no longer picks up and relocates wild animals. If you find the link, I would love to have it. Thanks! I bent it into shape and used stakes to hold it upright. I even put some on top. I can relate to your problem. Groundhogs are a problem in my area. This season I resorted to trapping & relocating them. That seems to be the only humane way to deal with them, because they can find an opening or dig under anything. I purchased live traps from Tractor Supply. We locate them to the local woods.